They make me a more efficient runner. Proven by nike+. When early December hit, I needed a new pair of shoes. My Asics Nimbus 13’s were starting to feel real flat after 600 miles. Reading and hype led me to want to try a pair of Brooks Pure Project shoes, but they weren’t available from my regular running store. Brooks decided to offer their shoes only to big box and stores that would carry the whole line from the beginning. While this creates hype and anticipation from restricted supply, it shuns the stores that foster the sport. 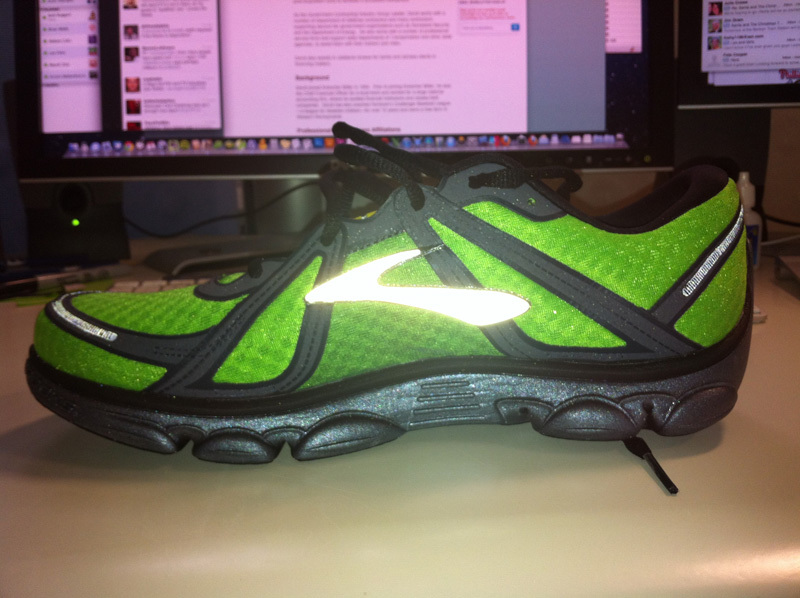 So taking a chance I ordered them straight from Brooksrunning.com. Note to Brooks: I will not buy running shoes from ANY big box store: I don’t trust them and they don’t offer realistic return policies for runners. The best I’ll do is try them on there, order them else where. Running in Asics for the last 3 years and never liking a single Brooks shoe, I absolutely love this shoe!! The improvements to my gate/stride were immediately noticeable after my first run, where my avg. pace/mile dropped by 30 s.! My pace is steadily 7:30/mi , even when I go out with the intent of a slow recovery run and don’t look at my watch for the whole 5 miles, I’m still 15 s/mi faster than my November runs. I am starting to feel some arch pain after my runs behind the ball of my left foot. A month before I bought the shoes I decided to try to crank 180 miles before the end of the year to hit 1,000 miles. Given the increase in my mileage since I bought the shoes, the transition to minimal running footware, and the amount of treadmill running i’m doing now this is not surprising in the least. I plan to push through and see how it goes. Landing more forefoot feels exhilerating, much faster and lighter on your feet. Each stride, push off I can feel my foot and toes separate and launch. At this point I don’t think I’d go back to anything else, I’m totally hooked! Every stride feels right, every push off feels powerful. This is what running is supposed to feel like. It’s natural and I dig it! This entry was posted on Thursday, January 5th, 2012 at 11:32 pm and is filed under Blog. You can follow any responses to this entry through the RSS 2.0 feed. You can leave a response, or trackback from your own site. Timbuk2, maker of hand-crafted messenger bags, has come up with one to rule them all. 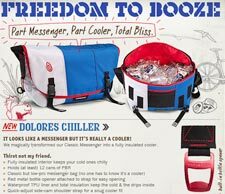 First they pioneered their On-the-strap Beer Koozie. Brilliant! Need I say more. This entry was posted on Wednesday, July 1st, 2009 at 8:03 am and is filed under Blog. You can follow any responses to this entry through the RSS 2.0 feed. You can leave a response, or trackback from your own site.